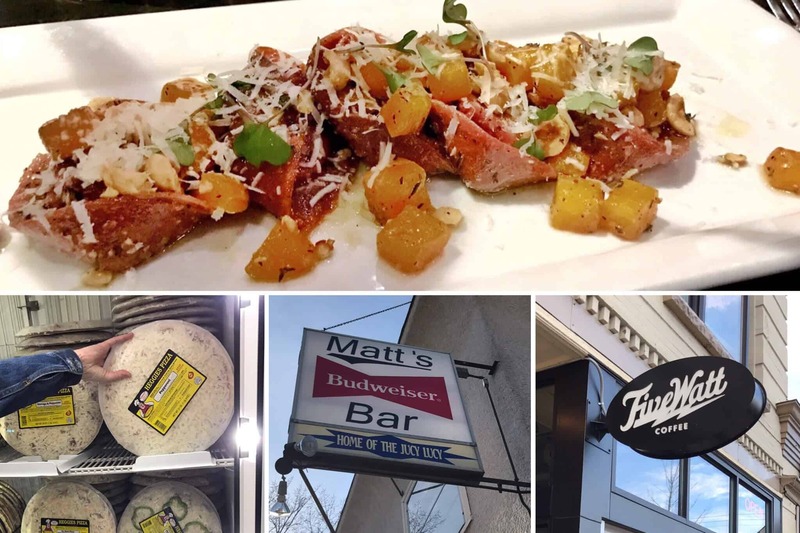 I may have to make a subcategory under “Foodventurous” just for Minneapolis. Since our oldest son moved there, my husband and I look for excuses to jump on I35 North and spend a weekend with him and his girlfriend. Our “excuse” this time? My husband and our almost-5-year-old Brittany, Stark, are avid pheasant hunters. When Marty saw that the convention was being held in downtown Minneapolis, he knew it wouldn’t take much to get me to go. 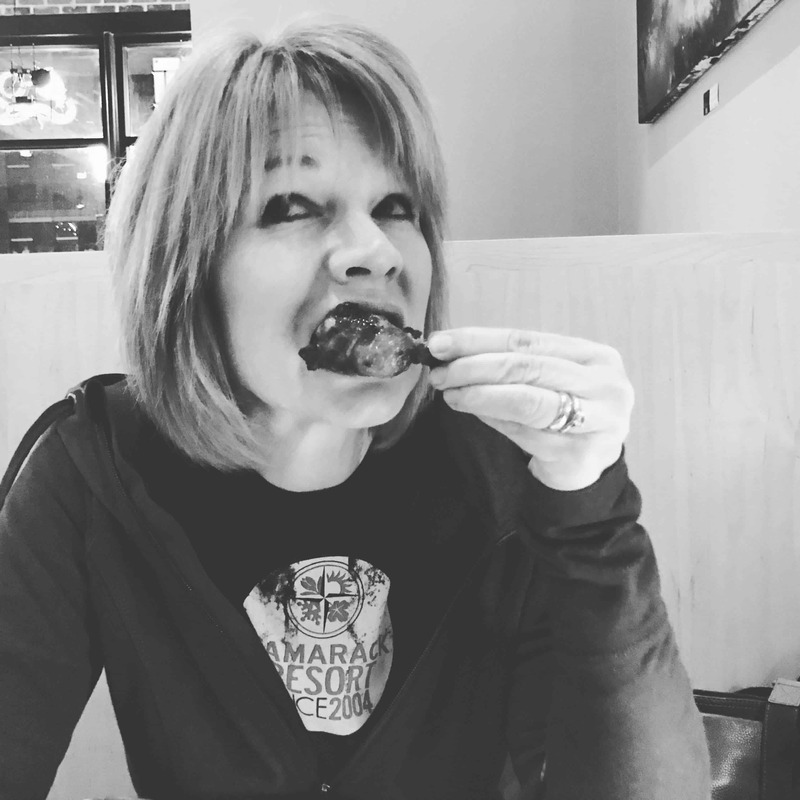 Spend time with our son and the promise of trying a couple new restaurants? Count me in. With a quick stop at IKEA on our way into Minneapolis (a new garlic press, single egg pan, two glass measuring cups, and a few birthday gifts later … yes, that’s all the damage I did), we were just in time to meet Nick and Katelyn after work. Our plan was to try an Italian restaurant that I had seen on … you guessed it … “Diners Drive-Ins and Dives“: Broder’s. Wish we had realized that Broder’s Deli (full of fresh pasta and Italian food items imported from Italy) was right across the street and a perfect place to browse, be warm, and pass time (note to self for next visit or note to you should you take me up on my recommendation). Because we didn’t arrive at the restaurant until almost 7pm, we had a 90 minute wait. penne rosa al rosmarino (pasta with rosemary, cream, chilies and tomato). You guessed it. I’m the beet and hazelnut plate. AMAZING combination! All four of us were pleased with our choices. Marty’s pasta with clams was particularly good. He’s usually a tomato-sauce guy but this may have shifted his preferences a little. Broder’s is one of those places that spoils my adventurous spirit … at least the Minneapolis-Italian portion of my foodie spirit. It still counts as adventurous spirit if you keep trying new things on the menu, right? 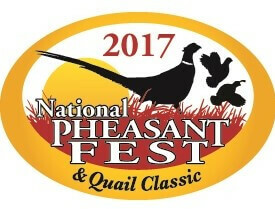 Saturday was reserved for two things: Pheasant Fest and ISU basketball. We wanted to be at the convention center by 10 am and I needed (more) coffee. 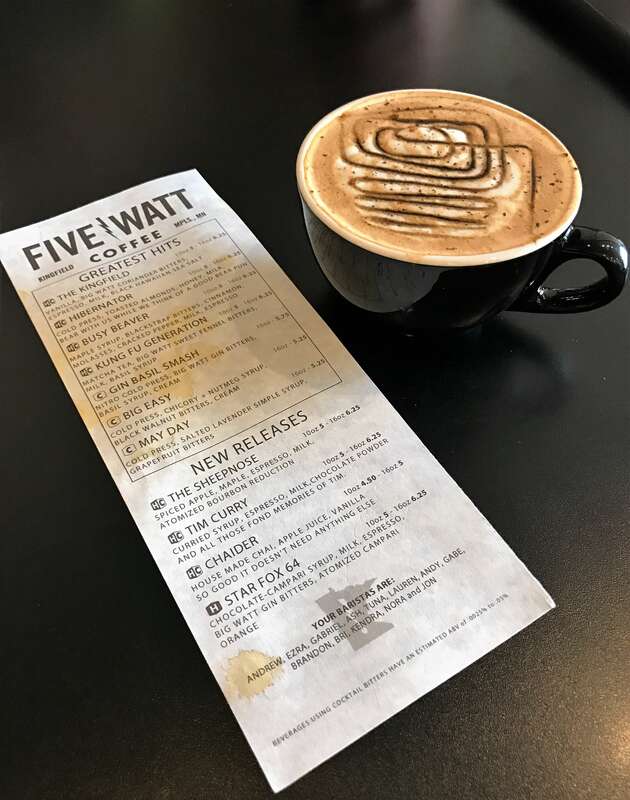 An Instagram post had grabbed my caffeine-depleted attention (somebody cut me off of Food Network and social media) and pulled me to Five Watt Coffee. 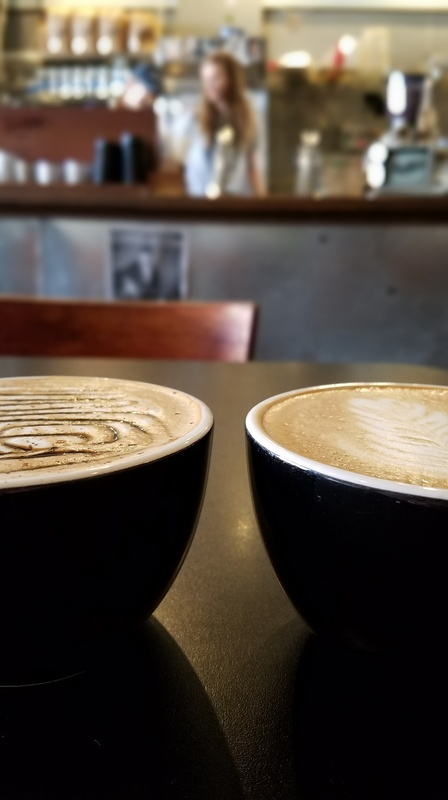 Warm, caffeinated, art in a cup. 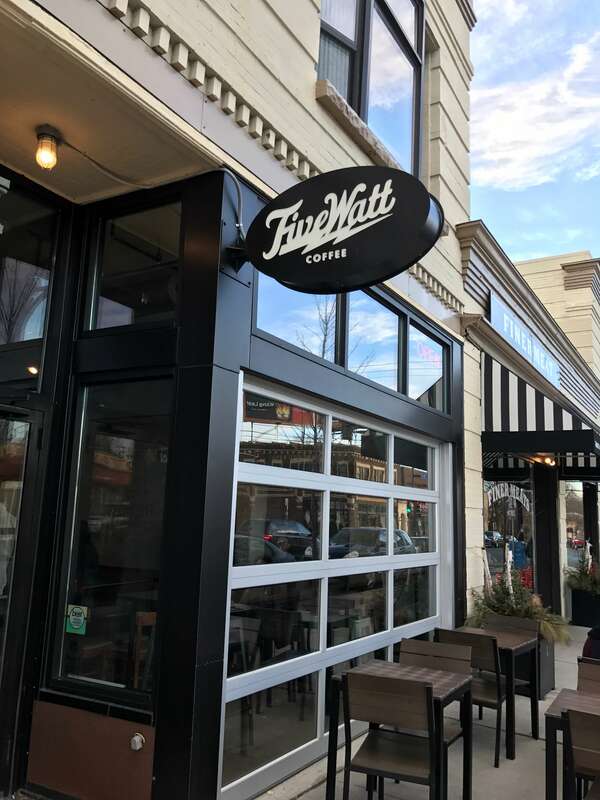 The two coffee drinkers in the group indulged in a Busy Beaver (maple, cinnamon, molasses and black pepper) and a Sheepnose (apple, maple, and bourbon reduction). The Busy Beaver tasted like German Peppernut cookies melted in coffee, a perfect combination. Nick had the Sheepnose and was nice enough to let me sample (like he had a choice) which was more subtle on the flavors. I think I would have liked his more had I not already tried, and fallen for, the peppernut concoction. Fully caffeinated, we were off to Pheasant Fest. The kids (yes, I still call them “kids” … it’s all relative) were willing to go with us once they found out there would likely be puppies to hold and dogs to pet. The convention center was filled with aisles of vendors handing out freebies, 6 stages set up around the outside for presentations and, yes, dogs! My husband had presentations on bird dog training he wanted to see and as I was looking through the program, I got a very unexpected surprise: a cooking stage! I don’t know why I didn’t expect it because the vast majority of hunters I know are very conscientious consumers and cooking wild game well requires special attention. Looking over the list of presenters, I saw the name “Amy Thielen” … cookbook author (The New Midwestern Table), Food Network Show host (Heartland Table), and Minnesota resident/celebrity/chef! 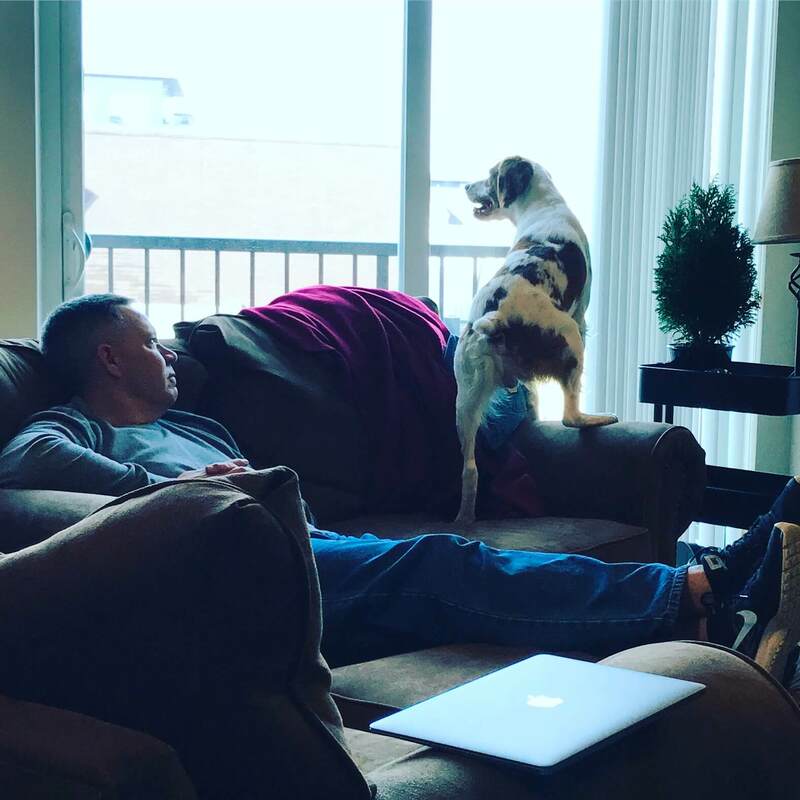 While Marty was learning more about dog training, and Nick & Katelyn were loving up dogs, I planted myself in her audience. 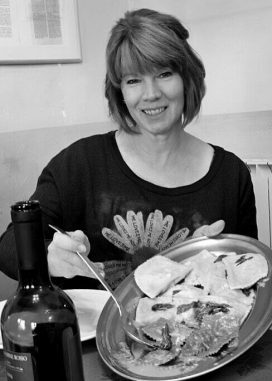 She presented a venison bolognese with homemade pasta and shared stories of her time as a chef in NY, her family’s butcher shop, and her hometown. She asked for help from the attendees in shaping the pasta and no one responded. I hate that. So next thing you know, I’m on stage with another cooperative soul, shaping pasta into orecchiette (little ears). By the end of her presentation, I had also won a pound of bacon from their family butcher shop and was in line for her to autograph my new copy of her cookbook. She was also kind enough to pose for a picture. Following Amy’s presentation, Hank Shaw was scheduled to speak. I was not familiar with that name, but my husband was. And I’m so glad I now am. Hank is, what I would call, a nature chef, as is evident by the name of his James Beard Award-winning website/blog: hunter-angler-gardener-cook. I knew I liked this guy when I saw that one of his cookbooks is titled “Duck. Duck. Goose.” and another “Buck. Buck. Moose”. He gave a very engaging talk on how to Build a Better Stew. I didn’t think I should spend more at this event than Marty so I didn’t buy his book … but I will be checking out his website and blog for more tips and recipes. There really was something for just about everyone at this event: coloring, painting, fishing and sponge-dart shooting for the kids (of all ages); nature preservation (DNR, NCRS, bees/honey, monarch butterfly displays, wildflower restoration); and did I mention puppies? 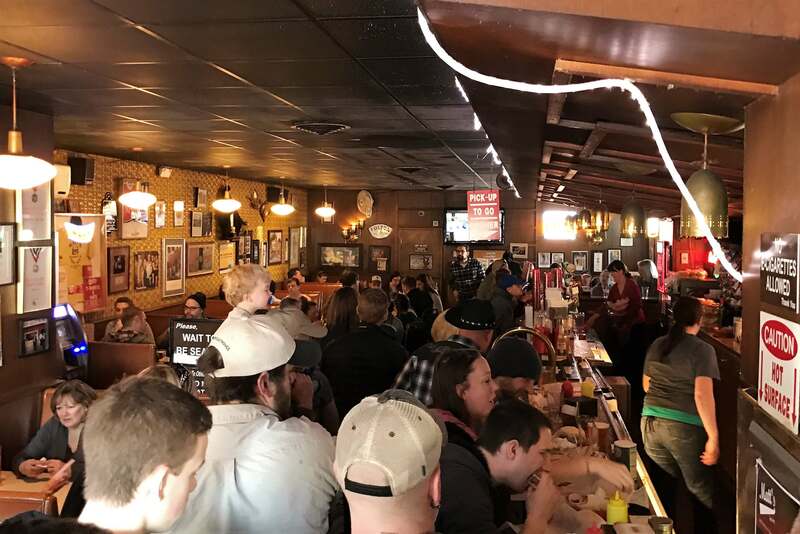 By midafternoon, we were ready to get off our feet, catch the Iowa State basketball game on TV, and dig into a Minnesota favorite, Heggies Pizza. 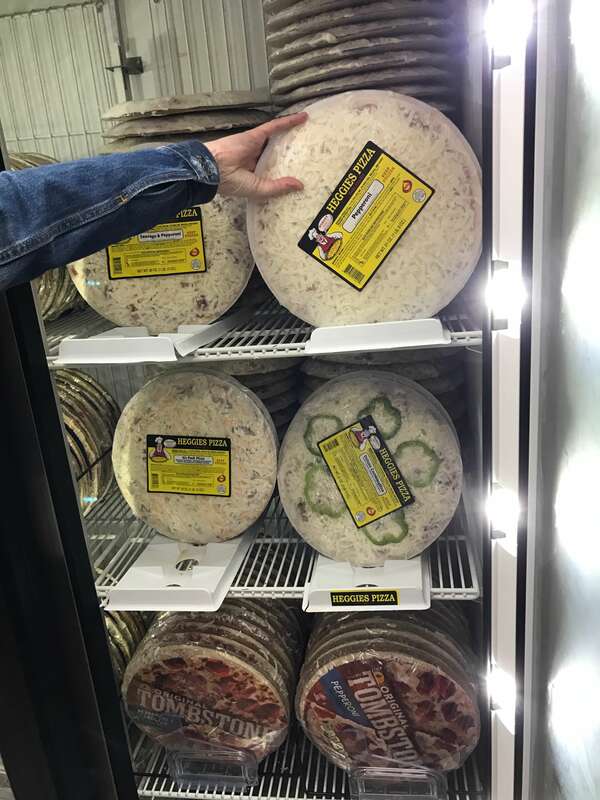 Heggies is a frozen pizza company based in Milaca, Minnesota (about an hour north of Minneapolis) and widely available at gas stations in Minnesota and Wisconsin. 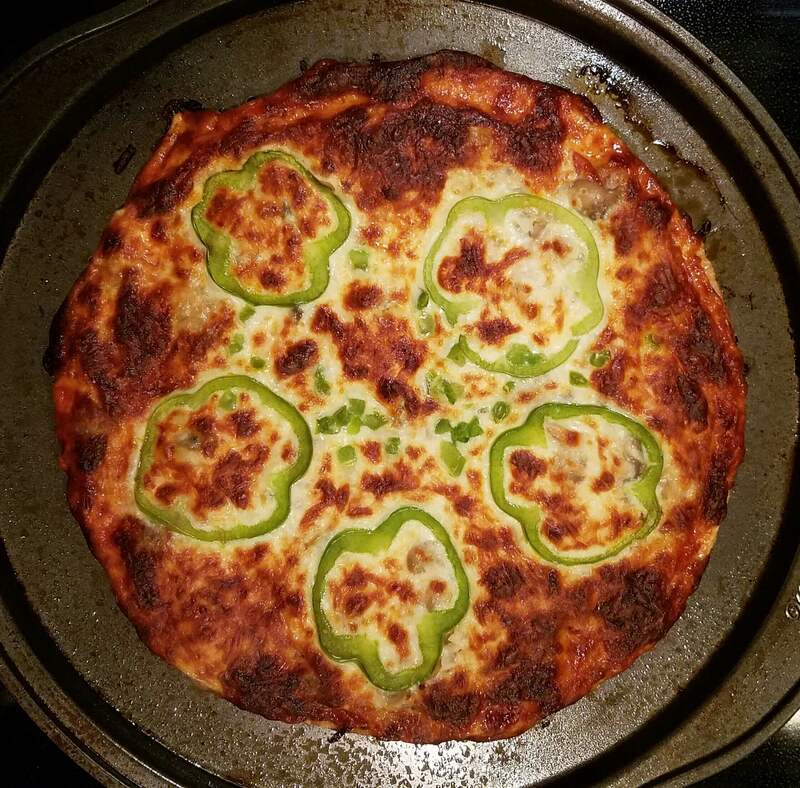 Apparently it is a crime if you don’t almost burn the top or if you cut it in triangles. All I know is it went great with a Cyclones victory and some of Nick’s latest batch of ale. Before heading back to Iowa on Sunday, we had two goals: a store my friend said I HAD to visit and a Juicy Lucy. The store is called Bachman’s and it is HUGE! It is a floral, garden center, home decor heaven, and cafe. Marty knew he was in trouble the minute we walked through the doors. 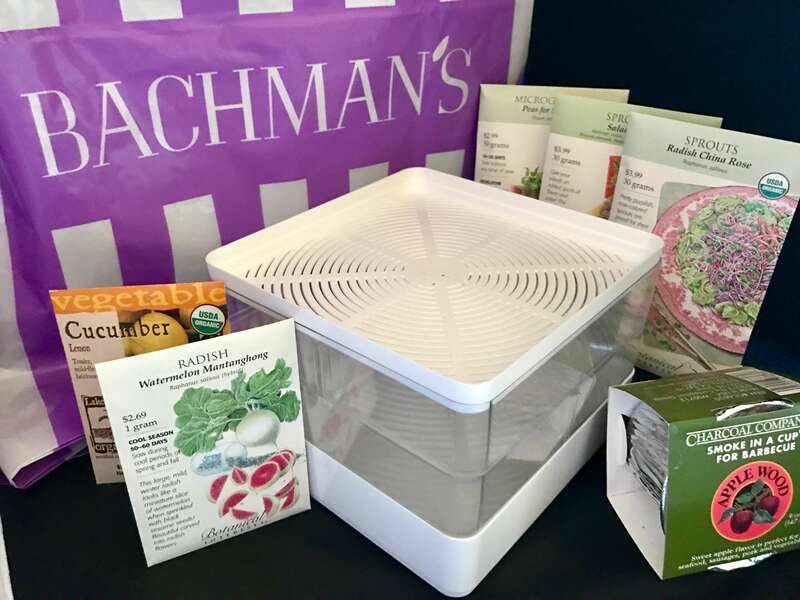 I found a seed sprouting system for the microgreens I’ve been wanting to try to grow as well as a few seeds to try in it. Watermelon radishes and lemon cucumber seeds also made it into my basket. I have been looking for the lemon cucumber seeds since we returned from our Colorado vacation last August. We were served these cucumbers as part of a salad at the Fly Fishing resort and my eyes were opened to a whole new concept of cucumbers. My final selection was this little Smoke in a Cup. I have wanted to experiment with adding smoke flavor to the food we grill and this will be the perfect starting point. I’m getting pretty excited just thinking about the pictures and blogs that will come out of this last paragraph, not to mention the food! After about an hour, I was rounded up and forced out of the building … a slight exaggeration … we were all ready for lunch. Burger time! 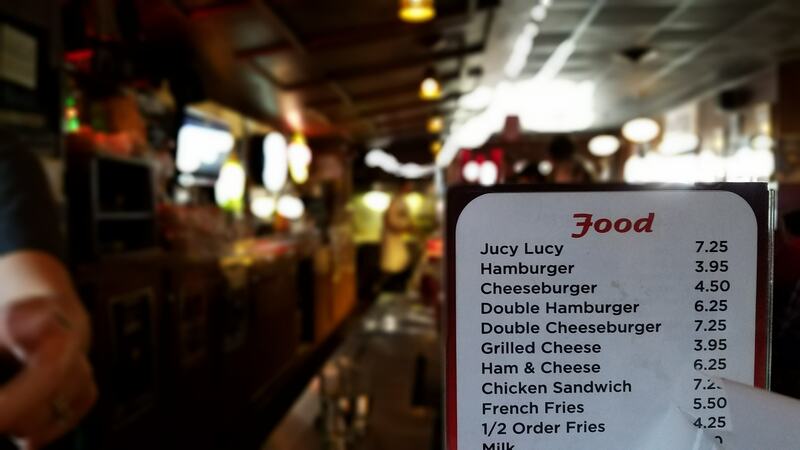 But not just any burger, a Jucy Lucy. This is Matt’s Bar. 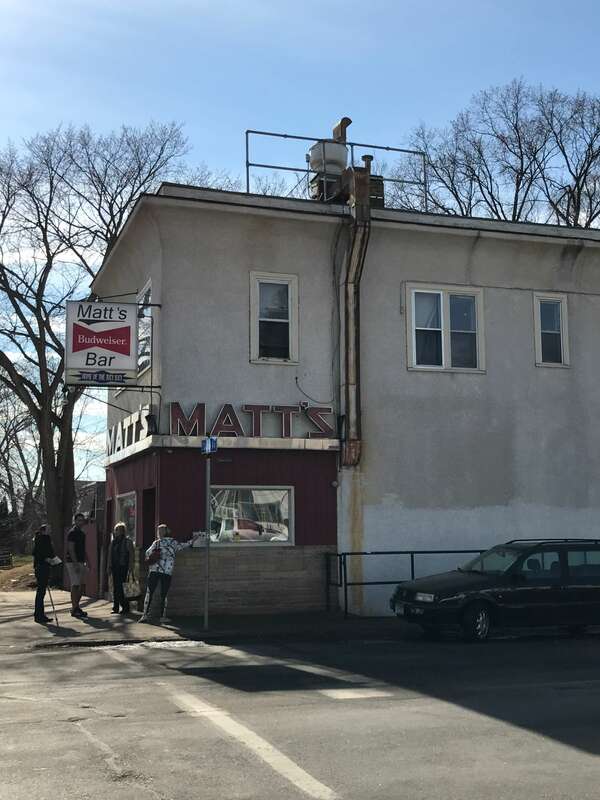 Matt’s is in a never-ending battle with at least one other Minneapolis burger joint for the title “Home of the Original Jucy Lucy”. This battle has been well fought on Food Network, The Travel Channel, YouTube, Twitter, Instagram, etc. 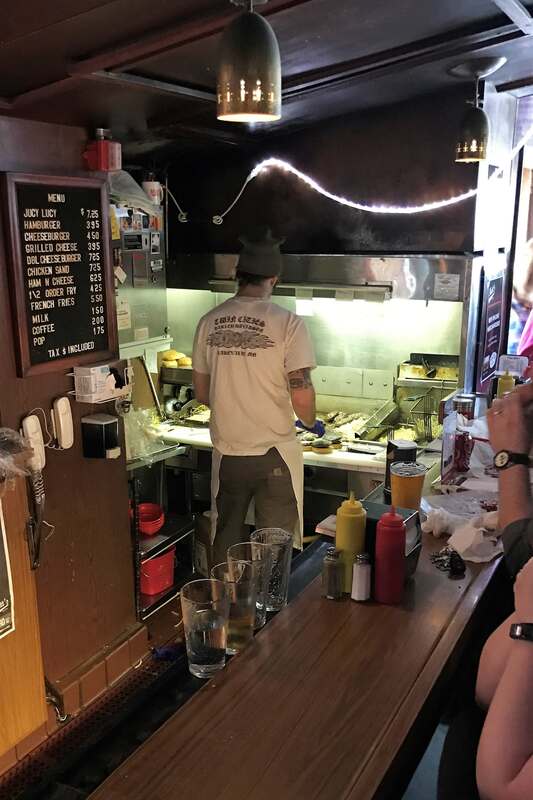 There is something about a line out the door of a small bar with a cooktop and fryer smaller than many kitchen islands (repeat after me: I will not complain about the size of my kitchen) that makes the food inside worth investigating. The only part of the bar that you cannot see in the top picture is a booth with a sign in it that says “It’s COLD in this BOOTH. 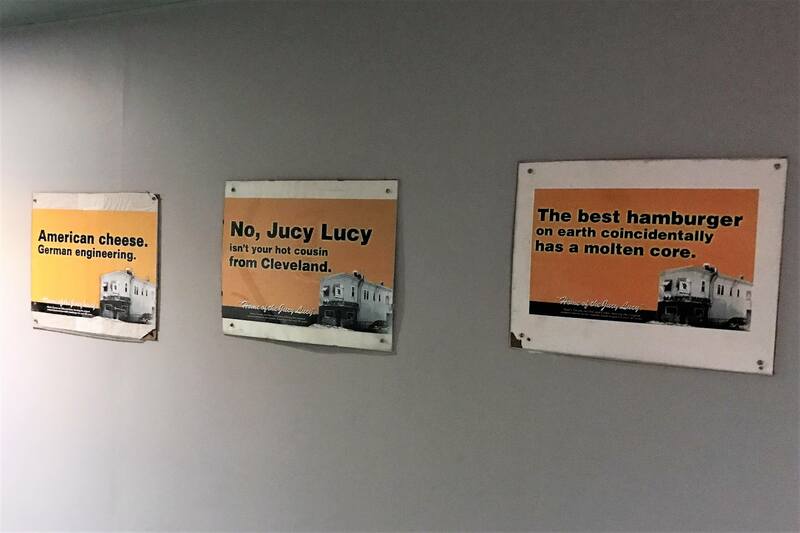 ALWAYS.” More fun signs were to be found downstairs on your way to the very clean bathroom. Four Jucy Lucys, a basket of fries, and a couple of beers please! 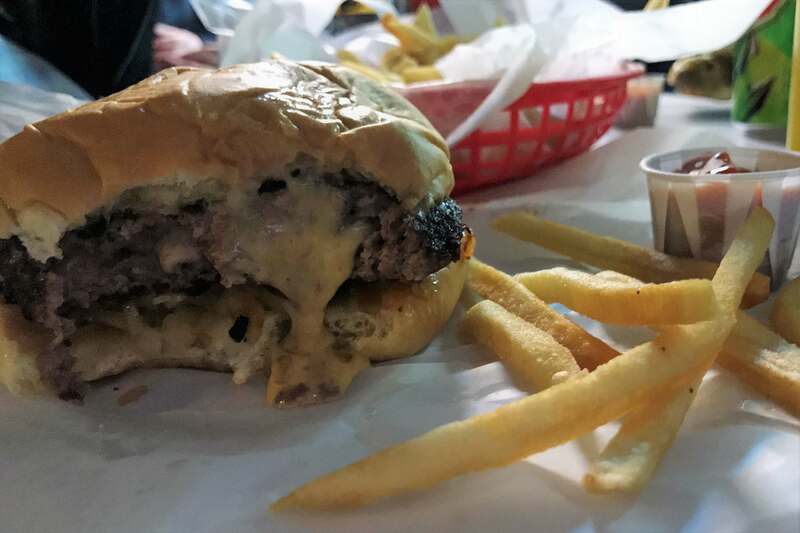 I’m not sure if I should blame the lighting in the bar or the fact that my hands were trembling a little with hunger for the lack of focus on the cheese in this picture but you get the idea! I think it’s the grilled onions that really puts this burger over the top. Onions and the charred edges … mmmmmmm. Tummies full, we head back to Nick’s apartment to pack up and head home. It is so much fun to spend a weekend in the city. Stark likes visiting Nick too. There are lots of dogs in the apartment complex. Mostly, he likes the view.